The Reverend G. A. Kratzer was a Methodist minister who left his church to join the Christian Science Movement. He took class under Edward Kimball, C.S.D., and later published Mr. Kimball's teaching in a book called "Teaching and Addresses". Rev. Kratzer wrote numerous articles for the Christian Science periodicals. Mrs. Eddy herself commented favorably on one of them, which was entitled Dominion Within. 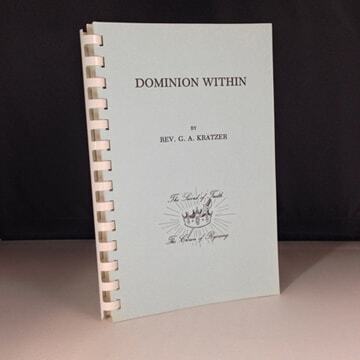 His book "Dominion Within" will be a helpful edition to any library. The book includes 25 articles in total.